The recently launched Bentley Continental GTC convertible has garnered a brace of high-profile awards just months after its international launch. The Robb Report, a US luxury lifestyle magazine, declared Bentley’s convertible its 2007 Car of the Year and the judges from L’Automobile piu Bella del Mondo (The World’s Most Beautiful Automobile) recognised the GTC’s beauty in a special design award. In Robb Report, the GTC beat the Rolls Royce Phantom, Bugatti Veyron and Maybach 57S to win its annual Car of the Year Awards. The panel of judges highlighted the Bentley’s ‘remarkable driveability, superb handling’ and ‘well executed design’. In fact, so popular was the GTC among Robb Report’s jury that eight judges went on to order one each for themselves. This is not the first time Bentley has garnered an award from Robb Report as the Continental GT coupe was voted its Car of the Year in 2004. In 2006 its Continental Flying Spur came a close second in the contest. The GTC’s second accolade came from an international jury based in Milan. 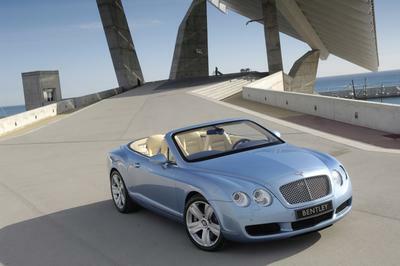 The judges praised the Bentley convertible’s exclusive style and modern design cues, which they felt reflected the unique heritage of the Bentley marque. This is the fourth award conferred on Bentley by L’Automobile piu Bella del Mondo jury, following the original Azure in 1995, the Arnage saloon in 2002 and the Continental GT coupe in 2003.